The core of the story is the same through both remakes. There’s this totalitarian Empire, which rules the surface world. It’s just called Empire, because there’s only one, ruling the entire world, so there’s no reason to call it anything else. At some point, they discover a vast network of cases deep underground. They try to explore it, it’s a fiasco, so instead, they start using it as a sort of prison, a place where they send anyone who doesn’t fit in in any way. The exiled people eventually organize, find allies, strike back, start a war with the Empire and eventually reach a sort of tentative peace. This happens through the first 3 games of the series. 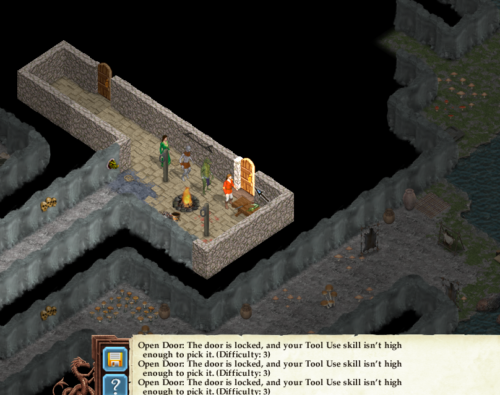 The later sequels added by the Avernum remakes expand upon the story a bit. And right off the bat, the remakes lose out a bit on the language. In the originals, Exile is a state of being. Everyone sent into the caves are sent into Exile, so, once they organise into a state or country of their own, they decide to wear that term and call their kingdom Exile. In the sequels, I guess Avernum is a play on cavernum, which works, but in a different, shallower way. 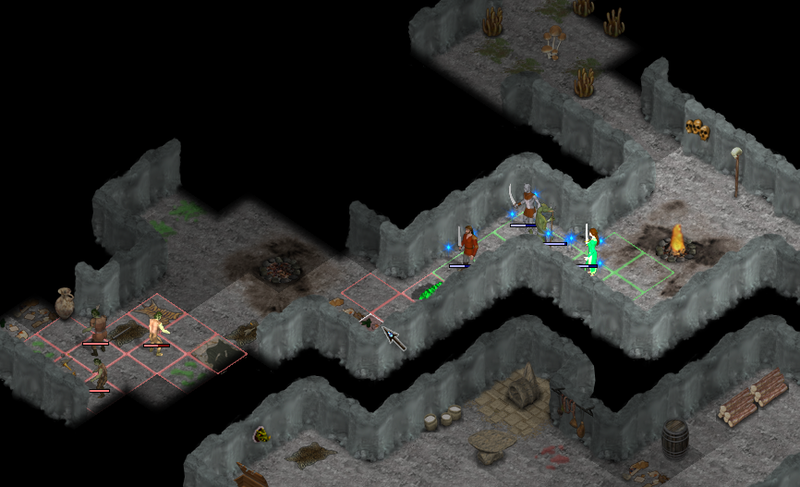 Much like in the original game, a new series of caves, closer to the surface, has been discovered by Exile/Avernum. They’re colonised and soon after, a tunnel leading to the surface, into a remote, backwater continent of the Empire is discovered. The player’s party belongs to a special section of the government, called Unspecified Services and they are to gather intelligence of the surface. Before that, however, they are urged to get some training by clearing out some caves in Upper Exile, close to Fort Emergence, where we start, which have been infested by goblins and bandits. In gameplay terms, the party is strong enough to go straight to the surface and succeed, but it certainly makes things a lot easier to start with these two dungeons first. Thus, they’ve been named appropriately namedTraining Dungeons by players. In this post, I’ll walk the reader through clearing the slightly easier of the two. 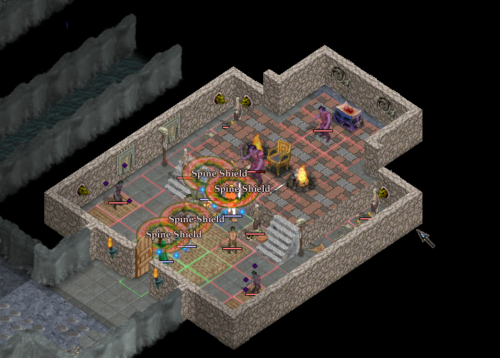 We start off with me just finishing the initial fight in the goblin dungeon. Pictured: The party, shortly after the initial fight in the goblin dungeon. I’m playing with the standard, pre-made party. In the original Exile 3, parties consisted of six members and you’d start off with a standard human warrior-type, a slith spear wielder, a nephilim archer/thief, a mage, a priest and a character that’s sort of a mix of both. This has been reduced down to 4 members starting with the first Avernum remakes. If I recall, in the first remakes, they tried to push you towards one of them being an archer/thief, but that build was so underpowered compared to a fighter and especially compared to a mage, it seems in this second line of remakes, they just go with two fighters, a priest and a mage. 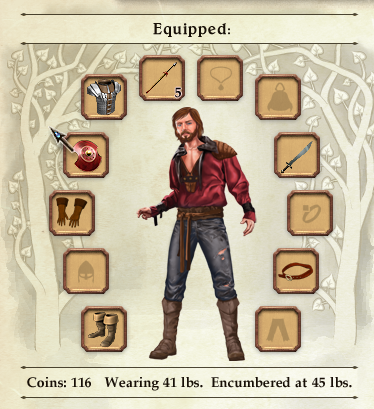 Pictured: The character sheet of Aldous, the standard human fighter character. What we see here is the typical character sheet. There are no explicit classes. You get points upon level up and you invest them into attributes and skills. Depending on how you spend them, you build a class of your own. Generally, the most effective way to go about it is to focus, though certain skills are useful to have on every character. But I digress, let’s explore and fight a bit. My mage is low on spell points, but I’m fairly sure we can survive a few more fights before having to rest. 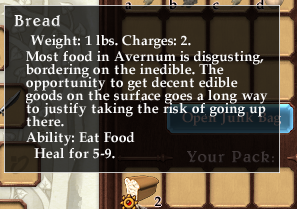 I find some bread on the ground and decide to have Horrum, my nephilim priest, eat it. In the original games, food was a necessity the party carried as a whole, together with money. You needed food to rest and regenerate, so you had to buy it and restock quite often. Pictured: The description of a loaf of bread. In these recent remakes, it has been reduced down to a cheap and mostly ineffective form of on the spot healing. Something you don’t use in combat unless desperate, but might as well use any you find in the dungeon, just so you can stay in there without having to go out to rest. 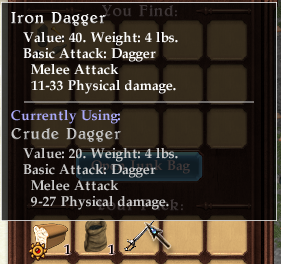 I also find an Iron Dagger, which is a decent upgrade to the Crude Dagger Horrum is using. Pictured: The UI shows a pop-up for comparing equipment. Shortly after, around a bend, I encounter another group of goblins. Generally, you just fight, but very often, there are various flavor texts that pop up when something happens. It isn’t always important, but it almost always makes the atmosphere every so slightly better. Pictured: Goblin encounter flavor text. 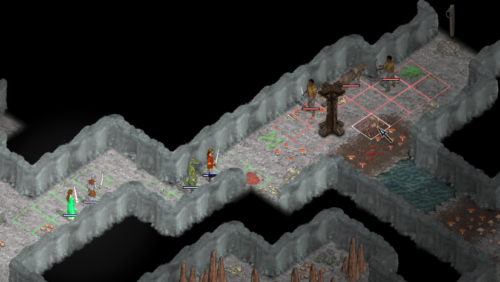 Since I start in a narrow tunnel, I want to make use of the natural choke point and have the goblins focus on my fighter. 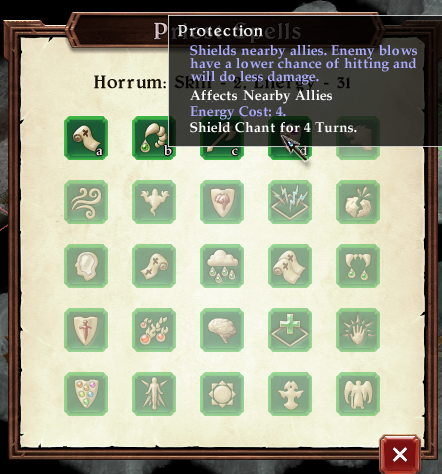 I also want him to survive, so I cast Protection with Horrum. Pictured: The priest protection spell. This is the typical approach early into the game in this series. Buffing spells make all the difference and are more spell point effective than direct spell attacks. In the original series, they’re also most effective throughout the game. A series of powerful blesses would have made your party a melee killing machine. In the remakes, direct damage with spells is far more effective past the early game. Also, due to changes to the AI, making use of choke points seems to have also become less effective, at least in some cases. The bait didn’t work and I’m forced to move in. Pictured: Only the venomous worm moved into melee. The goblins are firing from afar. Either way, soon the fight is over and there is looting to be made. Pictured: Some trash, a bit of jerky, some crude weapons and a few coins. They’re goblins so they don’t have much. Most of it goes to the junk bag, which is a bottomless bag where you put all the stuff you want to sell. It doesn’t make much sense logically, but it’s certainly a quality of life improvement compared to the original – each character is limited both by weight and amount of items carried. The coins just go into the pool and the belt will be worn by Zhess’Oss, my slithzerikai fighter. He probably won’t be wearing it for long, since it’s the weakest belt in the game, but he didn’t have one at all, up to this point. I also took the chance to move some equipment around so Aldous is less encumbered. Based on the character’s strength, they are only allow to wear equipment up to a certain weight, before suffering penalties. Pictured: Aldous was wearing 52, over the limit, so he was suffering penalties. If I recall correctly, there was a similar system in the original series, except it wasn’t as transparent. We explore some more and fight some more. Eventually, there’s another special encounter which wasn’t there in the original game. I think I remember there being one big fight which included a goblin chieftain enemy in the original dungeon, but it was just a nameless chieftain. Maybe you’d figure out on your own it was the ruler of the place, but while I usually don’t like having story explained too much to the player, I like this – it adds flavor. Anyway we don’t fight the chief yet. It’s foreshadowing to what happens soon. 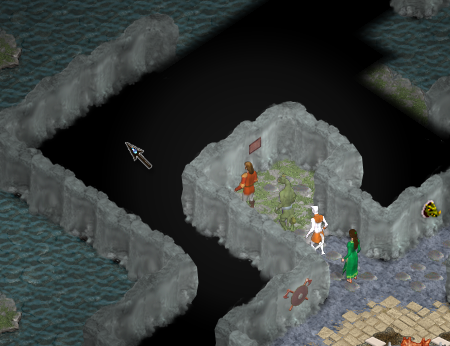 Some additional exploration get’s us to a secret area, reachable by pushing an easy to miss button on a wall. Pictured: The button opens a hidden area. It’s tiny compared to the game area, so it’s easy to miss. The secret area leads to a boat, which we can use to explore otherwise unreachable parts of the cave. Pictured: A boat the party can use to explore. The party enters the boat and is then able to move it. The advantage is, you get to go places you couldn’t, otherwise. The disadvantage? Enemies that can reach you can hurt you, and there isn’t much you can do about it. 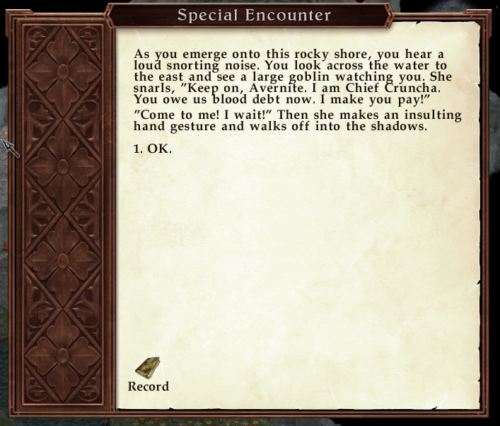 With the boat, we are able to go to the area Chief Crunch was on, where we get an encounter and reach a trap door, taking us to another level of the dungeon. But, there are things yet to explore here, so we don’t descend. Pictured: Sometimes special encounters include decisions to be made, and the outcome isn’t always positive. This one is. …and that ends really badly, so I decide to go with my initial strategy. Instead, I explore everything I can at the ground level and end up with some loot, enough experience to almost reach the next level and 3 locked doors. Locked doors are dealt with by the lock picking and the tool use skill. The way it works is, each door has a difficulty, which determines to minimum level of tool use required in the party to pick it. Past that point, a certain number of lockpicks is used up when you do decide to pick the lock. Having more tool use reduces the amount of lockpicks used to the point of completely eliminating them at a certain point. Pictured: I have no Tool Use and no lockpicks. I’ll have to deal with these later. For now, I go down to the lower level to keep exploring and soon, get enough experience for Aldous and Cordelia, our human mage, to level up. Not all characters advance at the same rate, due to experience being distributed based on kills and characters starting off with traits that give them advantages but incur an experience penalty, or vice-versa. 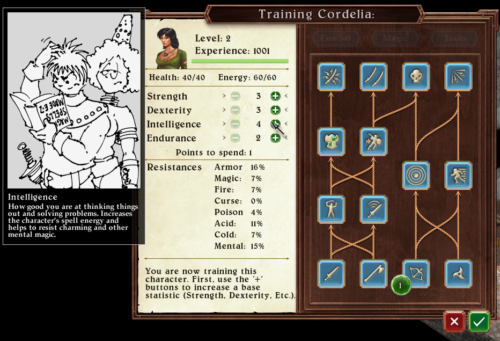 Anyway, let’s level up Cordeila. We have one point to spend among the four attributes and, since she’s a mage, we go with intelligence. 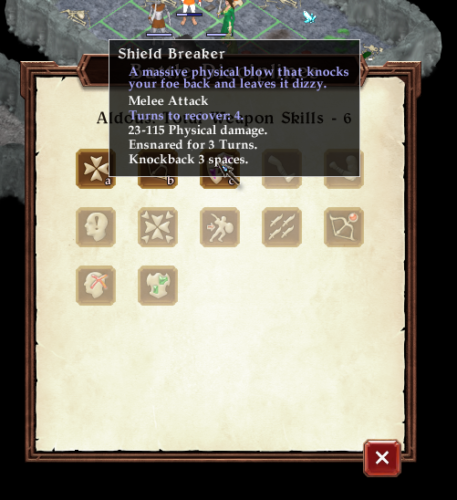 Pictured: Each attribute and skill has this funny little pop-up when you hover over it. They originate from Nethergate, one of the early Spiderweb games. Next, we get two points to spend on skills. I know the party needs tool use, so I put one point there. My other point goes into mage spells. Pictured: Levels in a spell “school” increase the potency of spells in that school. Really, there isn’t that much tho choose from and you can’t go wrong too much either. Past that, we also get to pick some traits, which give stat bonuses. I forgot to take a screenshot there, but I end up picking an intelligence and health increasing trait. 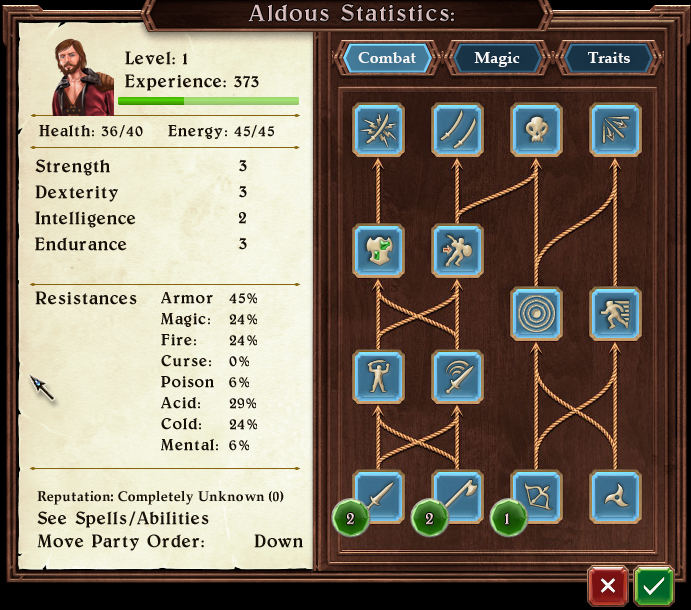 As for Aldous, I up his strength, his melee skill and go with a strength and health-increasing trait. I’m single-minded that way, and from what I remember, those are effective picks. Pretty soon my other two characters also level up. They only get one trait each, due to not being human. 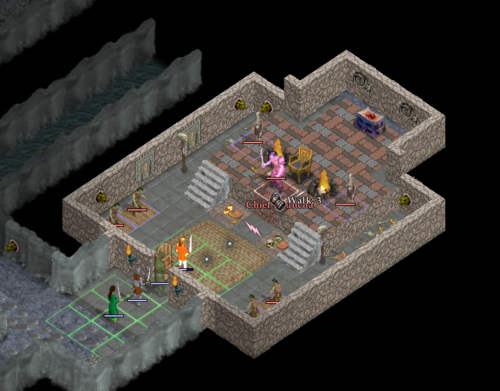 The lower dungeon level contains mostly wolves and their goblin keepers. One area, however, contains a young hellhound, which is a slightly stronger enemy this early in the game. He hits Aldous hard and stuns him, but this finally makes me remember this game has a thing called Battle Disciplines. Battle disciplines are basically spells for fighters. As you raise weapon skills, you unlocked some of these and get to use them while fighting. 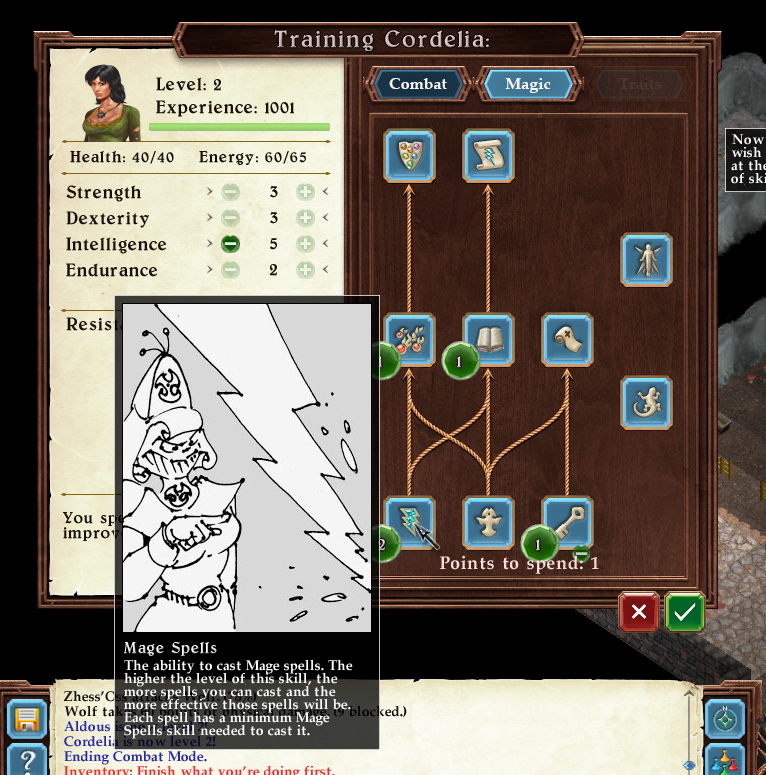 Instead of using up a resource, like spells do with spell points, battle disciplines operate on a fatigue system. Using a discipline causes the character to become fatigue for a specific number of turns, during which they cannot use another discipline. Even with these, the fight ends up being difficult, to say the least, but the party prevails and my reward is a blessed belt, an upgrade which goes on Aldous. 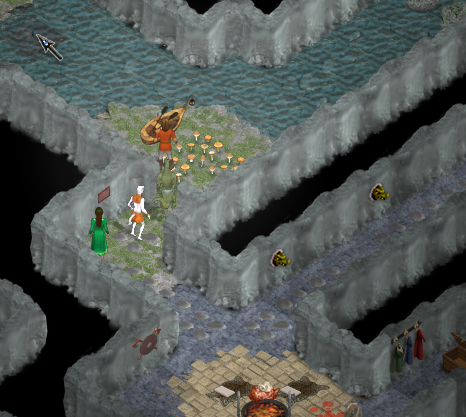 On this lower level of the goblin dungeon, I eventually find stairs leading back up, except to the bandit dungeon. I don’t feel ready for that yet, so I go back down, but not before I snag a few items from a nearby chest. 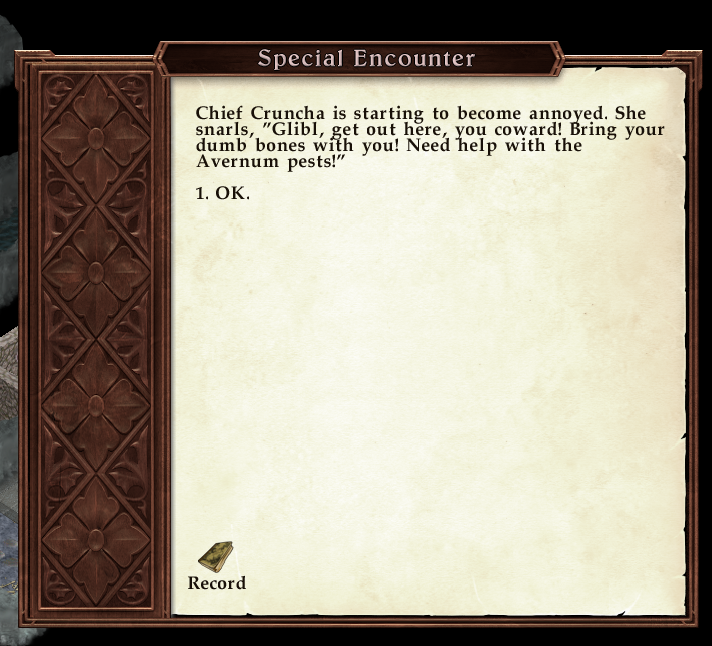 Pictured: Bandits are slightly more difficult to deal with than goblins. Back down, I notice something I’m unable to take advantage of yet, but should probably mention. There is a crack on a wall nearby. There is also a priest spell called Move Mountains, which destroys such a wall to reveal a section behind it. 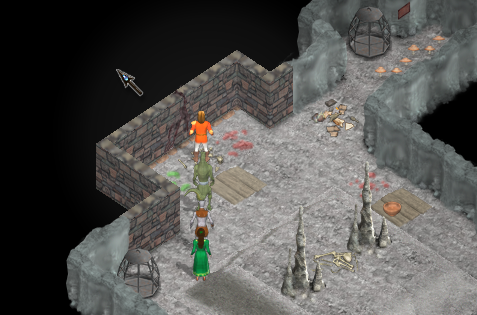 It’s one of the several gating mechanics that urge the player to explore and revisit old areas. Pictued: Move Mountains can also be used in combat, but it was originally intended to open up cracks like these. Cynics might call this unnecessary backtracking, but I like it. In the original Exile, hidden switches didn’t exist, but there were special encounters used in the same way. In addition to that, some walls were just fakes that you could step trough. Cracked walls broken by Move Mountains, however, existed even way back then. Sort of close to this area, but past a winding corridor section, I end up fighting some bandits anyway. Turns out, a few were placed in the goblin dungeon to. 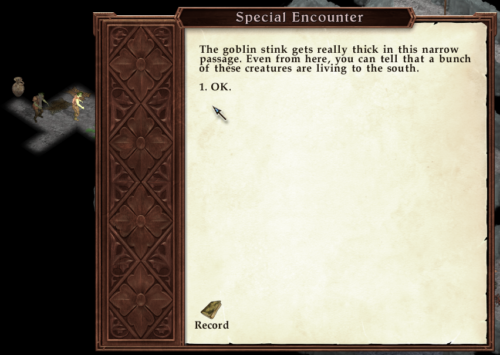 Pictured: Bandits hit way harder than goblins. Aldous was at full health before that single arrow shot. That’s by a special enemy, though. Bandits are tougher than goblins, but the thing that makes this battle difficult is that there’s a special, boss-enemy archer here. The fight takes us to the other side of the cracked wall, meaning having the Move Mountains spell here this early, would have made the battle a bit easier, since we could attack from behind and deal with the minions first. Pictured: The room behind the cracked wall. Much more importantly, winning the fight rewards us with a nice bow. Bows are useful things to have in this game, especially early on, due to having unlimited ammo. It means it’s something our spell casters can use when they want to conserve spell points, or something melee fighters can use when an enemy ensnares them, or is to far to be reached by melee in a single turn. 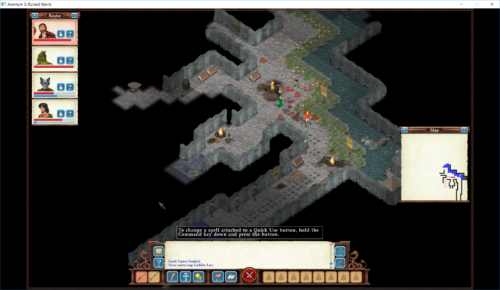 Shortly after this fight, I find another set of stairs to the bandit dungeon, and I explore the rest of the area. The fight happens in his throne room. He’s joined by 4 goblins and 2 skeletons, so with 7 enemies in total, it’s a great place for Cordelia to use her Daze spell. 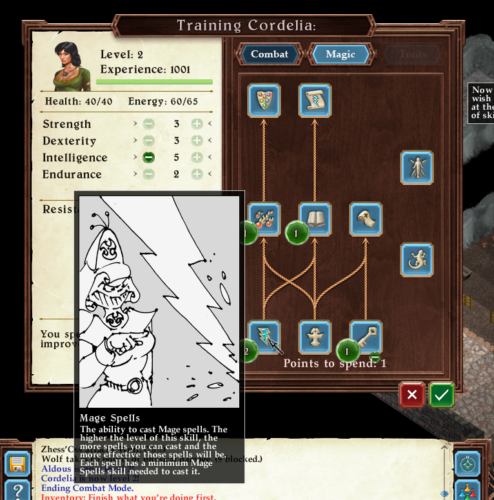 This is an amazing early spell which, for a few turns, simply takes a couple of enemies out of commission. The daze effect makes then not act, but is broken if you attack them. That means you get to focus on the ones unaffected by it. Now, this being an actual scripted boss encounter, things tend to happen, usually when the health of the boss drops to certain levels. In this case, he summons another named enemy. Pictured: Chief Crunch summons his shaman minion for help. 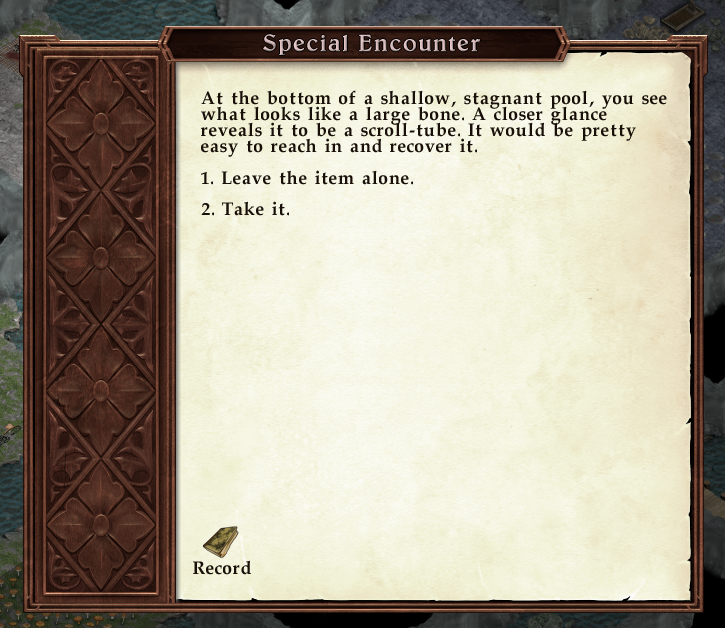 There’s this thing that RPG players tend to do. They find an item and then decide “I’m gonna save this for when I really need it” and end up not using it, ever. It’s especially common with especially powerful items, such as the Megaelixir in the Final Fantasy series, which is why some people named the phenomenon after it. In recent years, I strive not to succumb to this phenomenon, so I end up using most of my consumables at any appropriate opportunity. Even so, I end up it a surplus at the end of most games, but I also end up having much more fun. 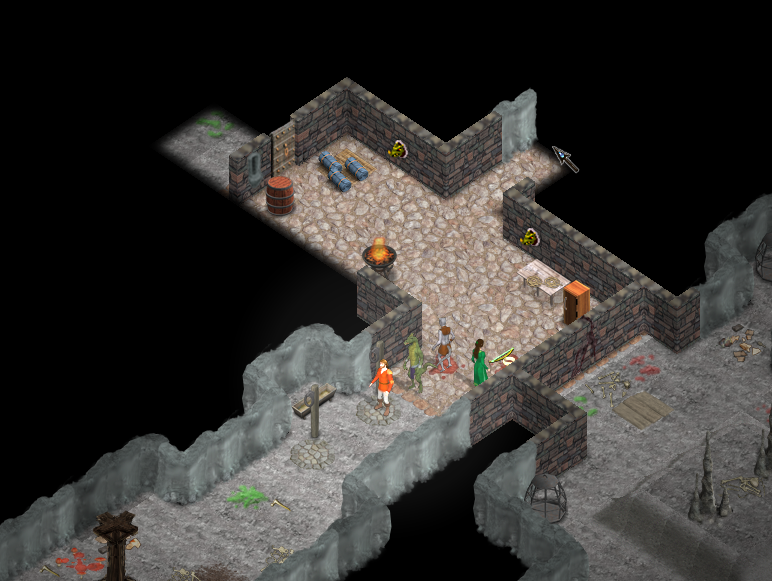 The reason for that sidenote is that I had a couple of consumables I looted in this very dungeon. One of them is a Spineshield scroll which causes enemies to get damaged when they attack my party. I also had a bunch of healing potions and scrolls all of which made this fight much easier. Pictured: Aldous just used the Spineshield scroll. In my early days, I would have conserved these items and tried to win the fight without using any, causing a lot of frustration and reloads. Within the same turn, Chief Crunch dies. Within another turn or so, the room and the dungeon is mostly clear. 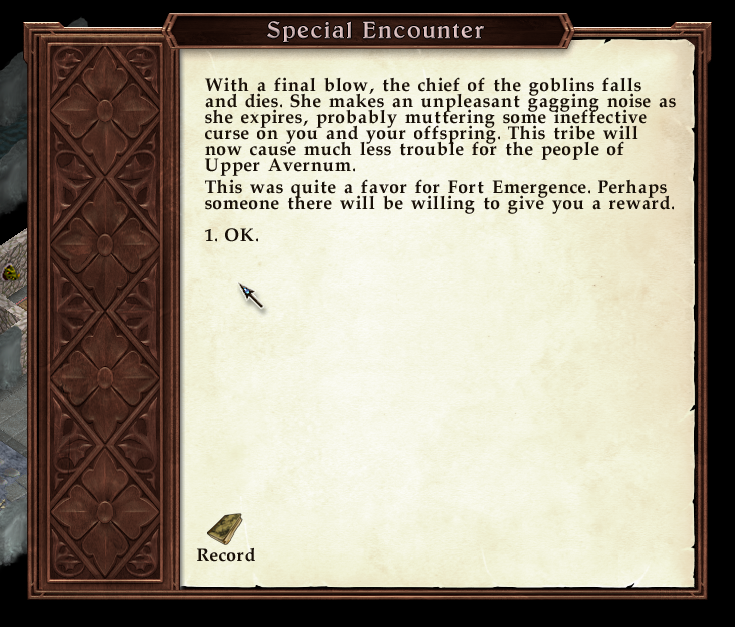 Pictured: The game suggests where to go collect the quest reward. I say mostly because we still have those 3 locked doors. Two of them, I’ll probably be able to unlock soon, but the third has a difficulty of 7, so it was meant to be returned to at a later time. With the skill points we’ve invested, we get to open the two easier doors for free. Turns out, that whole area is a cell block, though, so we don’t get any real prizes. 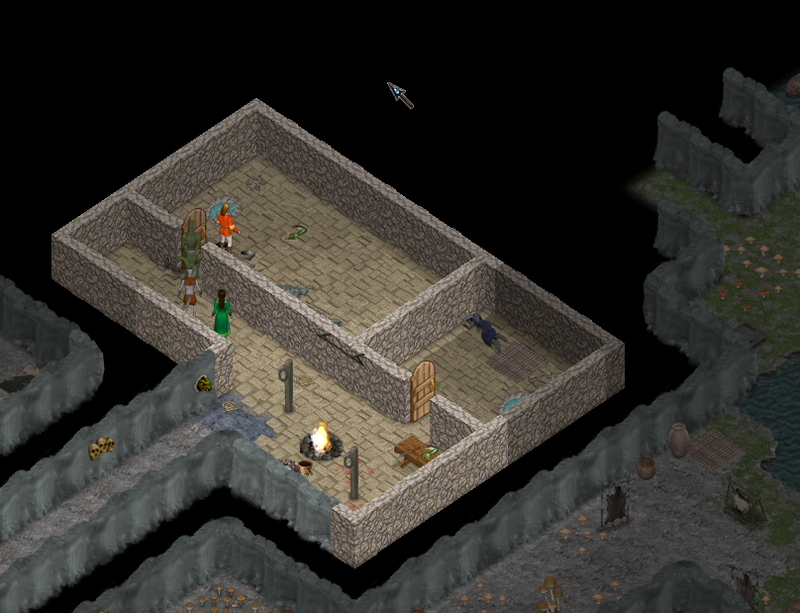 There’s a body of an imprisoned dead Avernum soldier, and a cell holding a giant lizard. Pictured: At least unlocking the locked cells and killing the giant lizard netted some experience. I can guess what’s behind door number 3, but no sense in spoiling things unnecessary. Instead, I’ll leave some exploring to the reader. I’m never satisfied with my answer to questions like these. 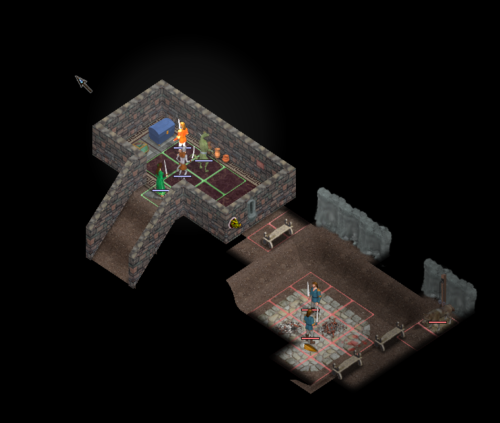 Exile 3 felt deeper, more complex at the time. Now, it would probably feel bulky and cumbersome in some aspects. 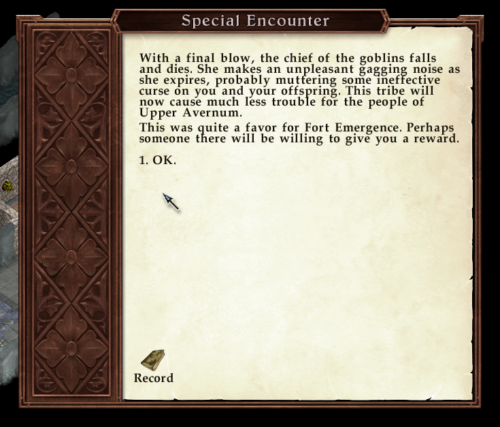 Avernum 3: Ruined World is definitely smoother to play, but I can’t help feeling like some of the curiosity and depth was lost as part of the streamlining. Certainly, I would prefer a game balanced and revolving around a party of six, not four. Still, the game seems interesting and even a tad deeper than the first line of remakes, so it’s at a good point of compromise between the two. I’d probably shift that point a bit more towards Exile 3 still, but I’ll take what I can get. Either way, for now, this early, it seems like a fun game and I see no reason not to play through it, considering I did the same with Avernum: Escape from the Pit and Avernum 2: Crystal Souls, which I haven’t written about here. It certainly on par with the rest of the series as well as other Spiderweb games. Official site of Spiderweb Software Inc.